TrustSharePoint: Notes from SPC14: Load Testing SharePoint 2013 Using Visual Studio 2013… with no code! 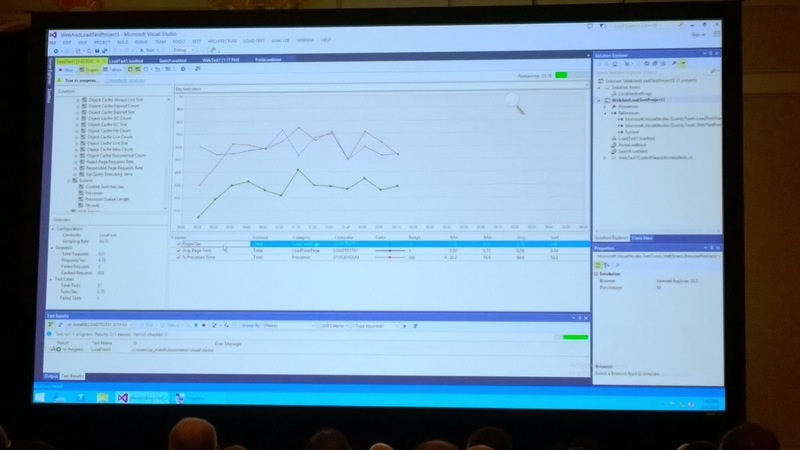 Notes from SPC14: Load Testing SharePoint 2013 Using Visual Studio 2013… with no code! You always find more you can load test as you get into it, but "doing something is better than doing nothing!" Performance testing - Does it work? Load testing - Does it really work? Scale up the users/requests/transactions; Concurrency, etc. Stress testing - When does it stop working? Where do things break? Capacity or scale testing - Will it work for us? You have a number in mind. Web test gets created in Visual Studio project - a window will come up "detecting dynamic parameters" looking for form pages, submit buttons, values used during test, etc. Great comment in the code of the web performance test: This code was generated by a tool. LOL! From test results you can see where the bottlenecks are: do you need more ram, more cores, etc. Can you simulate running tests against multiple WFEs? …can mistakenly make it look like your SharePoint servers are the source of the performance issues! SPC14 - My Session Picks... If I Get There!